Ocean Grove Collendina Cobras Junior Football Club has moved to hose down fears that its future is clouded. The article said there were fears that the Collendina name would be dropped in favour of Ocean Grove Cobras Junior Football Club and the guernsey could be redesigned. Currently the Cobras operate all junior teams that don’t have a finals system, from Under 13s down. Ocean Grove takes on the older juniors. Ocean Grove Football Netball Club president Tony Potter and Collendina Cobras president Shaun Stow issued a joint media release late last Thursday in anticipation of the Advertiser article. 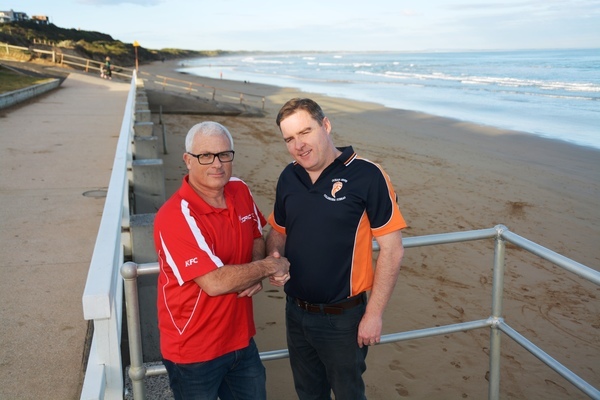 “Over the past two seasons, representatives from the executive committee of both the Ocean Grove Football Netball Club and the Ocean Grove Collendina Cobras Junior Football Club have been working collaboratively on fostering and strengthening the junior pathway of Ocean Grove football now and in the long term. Information from these meetings has been shared with each general committee and whilst there have been plenty of robust discussions, our goal is to realign much closer,” it said. “As a result, we have discussed many facets of football in our community and initially 2018 saw the relocation of our Auskick to Collendina Reserve under the guidance of the OGCCJFC, whilst the OGFNC took control of the U15 boys. “Currently both committees are working on a strategic alliance/Memorandum of Understanding which will need ratification by members of both clubs, but will hopefully strengthen the junior football pathway for our kids and community and with these combined resources will ensure our kids get the best support, development, equipment and facilities available. “The Ocean Grove Collendina Cobras JFC has been running autonomously for the past 14 years and has the full support of both the Ocean Grove FNC and AFL Barwon. “Unfortunately we have been approached recently by local newspaper journalists about the disharmony of football in Ocean Grove. As club presidents, we have responded by reinforcing the partnerships we are working hard on and in fact we believe it the relationship between both clubs is currently the strongest it has been since the clubs originally split some 16 years ago.